There are elegant shopping malls all over Dubai. The Mercato mall is an elegant mall in Italian architectural style with several restaurants and upmarket shops to the east of Dubai city. 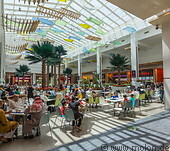 The Mall of the Emirates is a large high-end shopping mall with a total area of 640000 sqm. It contains Ski Dubai, an indoor ski resort with 22500 sqm of indoor skiing area and a 60m high artificial mountain. 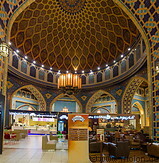 The Ibn Battuta mall lies 35km southwest of Dubai close to the Jebel Ali zone. It consists of Chinese, Indian and Arab sections. City Centre Mirdif is a large and modern mall with shops, restaurants and an entertainment area located a few km southwest of the airport.